The short answer: Truthfully? I have no idea. And frankly neither do you, because I don't think there is a correct answer to this question. Many Bears fans would disagree, and after back up Josh McCown defeated the Green Bay Packers at Lambeau Field on Monday Night in early November, a good majority of Bears fans decided they'd prefer to let Jay Cutler walk and stick with McCown. After the 2013 NFL season concluded, that suggestion, which seemed extremely short sighted in the middle of the season, isn't a half bad suggestion at the end of the season. McCown started 5 games for the Bears and played in another 3. In that span he completed 66.5% of his passes, and he threw 13 TDs versus only one interception. He actually ended with THE BEST QBR out of every quarterback (including Peyton Manning) in 2013 with an 85.1 (out of 100). However, during that span, he faced some pretty horrific defenses which included the Washington Redskins, Green Bay Packers, Dallas Cowboys, and Minnesota Vikings. He struggled against better defenses such as the St. Louis Rams and Baltimore Ravens. I think the bigger question isn't whether Josh McCown will replace Jay Cutler if the Bears refuse to go after Cutler / don't sign him, but which quarterback will. It's no guarantee that McCown will even resign with the Bears. Not only are there reports that McCown will retire, but he is also now a free agent. Last year McCown made $865,000. Chances are good that he'll be able to get a few more sheckles than that from any other team in the league. If the Bears choose to make McCown their starter, even for the short term, they will still have to pay him like a starter. Let's say that the Bears think Cutler is worth less than what he's asking for and McCown doesn't end up playing for the Bears- something that could easily happen. Who would then play quarterback for the Bears? Labels: 2013 Pro Bowl, Pro Bowl, The 46, Who Deserves To Be A Pro Bowler? I don't know why Childish Gambino (aka Donald Glover aka Troy from Community) has to produce some of the most boring music videos (see: this, Heartbeat) but nevertheless, his songs are incredible. Gambino has great flow, catchy hooks, and probably the best rhymes and lyrics out of anyone currently in the rap game (sans Kanye). "3005" is quintessential Childish Gambino, and I wish his songs got more radio airplay, because they're so good. Notice a trend? My confirmation bias does. QBs that win the Superbowl tend to be within the age of 26-30. Ben Roethlisberger was the youngest QB ever to win a Superbowl at the age of 23. While of course it's certainly possible for younger QBs to win it all, that's the outlier and not the norm. Eli Manning was a month into 31st year alive when he won the Superbowl in 2012. I think this mainly means that QB's who are older in age do NOT win Superbowls. That's not to say they can't, it's just to say that they don't, at least not in recent years. I'm a huge supporter of Boardwalk Empire, and was screaming until I was blue in the face about how excellent Season 3 of the show was. Since its inception, Boardwalk Empire has just gotten better and better. At least for the first 3 seasons. I thought Season 4 was a huge step back for the show. For starters, there was no big bad for the show's "lead" Nucky Thompson (Steve Buscemi). Sure, Dr. Valentin Narcisse (Jeffrey Wright) was a great big bad for the show in general, however he mainly was the villain for Chalky White (Michael Kenneth Williams). And as much as I love Chalky (aka Omar from The Wire), I realized this season that I really enjoy him as a supporting player to Nucky, and I'm not a huge fan of him as a co-lead. Boardwalk Empire has always been a show that was carried not by its lead, but by its more entertaining co-stars. And there's nothing wrong with that. Scrubs and How I Met Your Mother made excellent careers out of that dynamic. 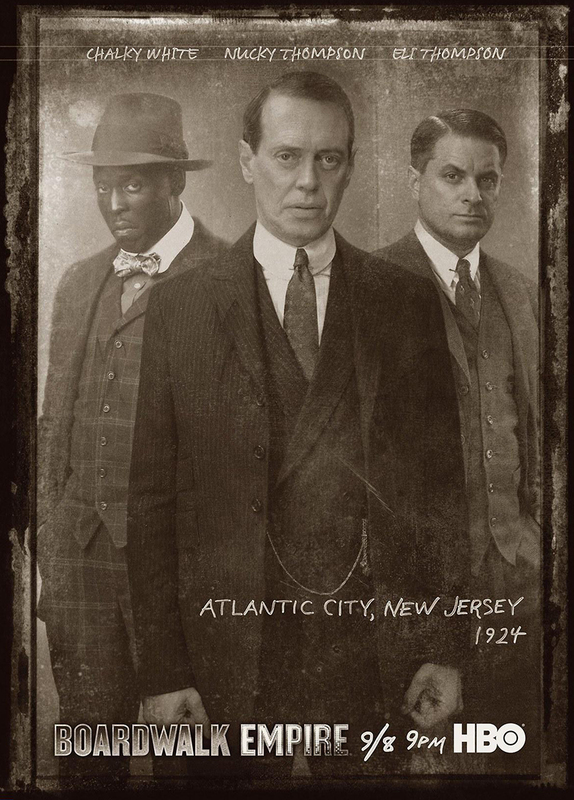 But now that many of the sub-players are in different states with little to no connection to Nucky Thompson, this show felt like more of a jumbled mess than Game of Thrones. Nucky Thompson is a pretty boring character by himself (as Season 4 has really brought to our attention), but the plot still needs to run through him for the show to work. It's still really good, but it didn't live up to its full potential in 2013.